In trying to get a clear picture of pianist Vijay Iyer, it’s hard to know which direction to look. His series at the Walker this Thursday and Friday, however, is a start. The two nights reveal a large part of the Venn diagram musical world he inhabits. Wadada Leo Smith, on the program Thursday night, is a professor at CalArts and very much a part of the Bay Area scene that is one part of Iyer’s musical provenance. The Iyer+Ladd album is a powerful statement, with continuing resonance for “imagining a new moment for community in the post-9/11 world of surveillance of people of color, which has created a force for us coming together,” as Iyer told the Star Tribune Saturday. Friday night’s show at the Walker will conclude with a set by Tirtha (pronounced THEER-tha), another Iyer trio, featuring Nitin Mitta on table/percussion and Prasanna on guitar and vox. Iyer told the Star Tribune that, “Tirtha to me is a political project because it encourages shared creativity across the South Asian diaspora.” Musically, Tirtha merges Carnatic forms with jazz and “fuse their influences through many other catalysts, including Reichian minimalism and rock,” according to the Guardian. There was “shared creativity across the South Asian diaspora” also on Vijay Iyer Trio’s 2009 album Historicity, in their cover of M.I.A.’s “Galang.” The Vijay Iyer Trio will presumably be playing many new cuts from their forthcoming album Accelerando (which is scheduled for release March 13) on Thursday night, but I hope they revive this cover for the set. Iyer’s place in the indie/pop sphere is one aspect of the Venn diagram that won’t be covered in the Walker two-night program. Iyer has collaborated with hip-hop group Das Racist, producing their track “Free Jazzmatazz.” The Independent Film Channel reports that Iyer will also be co-starring in a short film Dosa Hunt, still to-be-released, in which “Rostam Batmanglij (Vampire Weekend), Vijay Iyer, Ashok Kondabolu (Das Racist), Alan Palomo (Neon Indian), Amrit Singh (Stereogum), Himanshu Suri (Das Racist), and Anand Wilder (Yeasayer)… pile into a van… looking for the best dosa in New York City.” Iyer also recently contributed a remix of Meredith Monk’s “Rain” for a Meredith Monk remix album produced by DJ Spooky, which also features remixes by Björk and Nico Muhly. 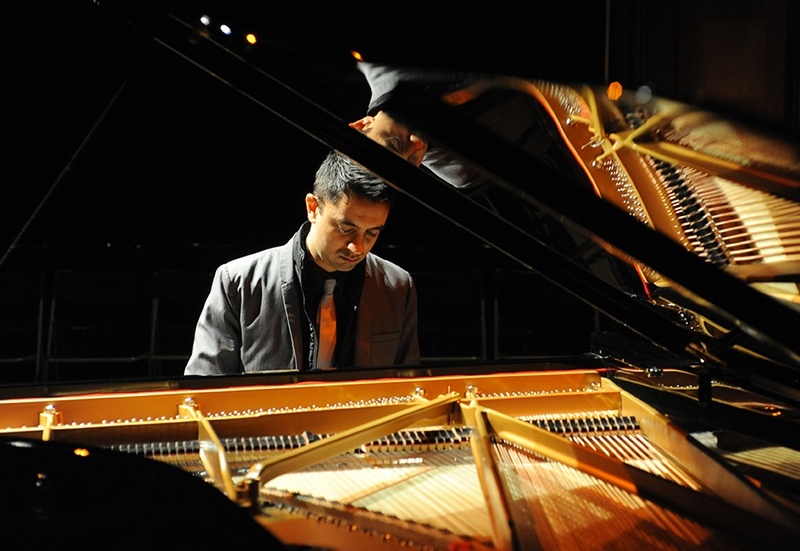 Thus the indie/pop connections circle back to the realm of the avant-garde; Vijay Iyer’s musical world might be better described as a Möbius strip than a Venn diagram. And speaking of Möbius strips, Iyer could tell us a lot about them. He recently led a talk on “Music and Math” at Duke University that featured “a timbre experiment…called ‘a Möbius strip of pitch.’” Iyer completed undergraduate studies at Yale in Math and Physics, and finished his PhD in Technology and the Arts at UC-Berkeley. Thus his choice to play jazz seems significant for what he has left behind, or rather, left on the side. His many musical projects show the potential that music holds for building community and opening up a dialogue about political engagement and activism.